The 27th CERN School of Computing will be held at the Conference Centre, Le Palais du Grand Large, Saint Malo, France, from Sunday, 4 September to Saturday, 17 September 2005. 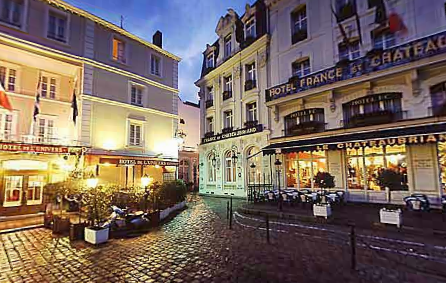 Participants will be accommodated, with half board, in the Hotel de France et de Chateaubriand and in the Hotel de la Cité, situated in the old walled town of Saint Malo and both 15 minutes walk away from the Palais du Grand Large. All participants at the School will be lodged in comfortable double rooms with private bathrooms. Registration Participants should reach Saint Malo for registration during the afternoon or early evening of Sunday, 4 September. Registration will take place at the Hotel de France et de Chateaubriand. You should note that lunch on the day of arrival is not provided. The School will end on the morning of Saturday, 17 September after breakfast. One is the Rennes Saint-Jacques airport (73 kilometers from Saint Malo) which has 22 daily connections to French and European towns. From Rennes Saint-Jacques airport take a taxi to Rennes train station and then by train to Saint Malo. The second is the airport at Dinard-Pleurtuit which is 10 km from Saint Malo and can be reached directly from Jersey, Guernesey and London airports. However, the nearest major airport in France is Paris Charles de Gaulle. From Paris take the TGV to Rennes (3hrs) and then normal train to Saint Malo (1 hr). There is also a ferry from Portsmouth (UK) to Saint Malo . The sum of the Fees plus the Living Expenses, that is 1500 Euros, should be paid to the account below prior to the school. This amount covers tuition, lunch and two daily coffee breaks at the Palais du Grand Large, and accommodation and full board at either the Hotel de France and Chateaubriand or the Hotel de la Cité, from dinner on Sunday, 4 September to breakfast on Saturday, 17 September 2005. Some social activities, of which details will be given at a later time, will be organized at no extra cost. Candidates should ensure that not only have they completed the web application form, but that a signed formal letter of reference from their professor or supervisor, reaches the School Administrator (Mrs Jacqueline Franco-Turner) by 15 May 2005 at the latest. In addition, a certification form (PDF version | Word version) must be filled in and signed by the applicant's professor or supervisor (and not by the applicant) and returned to Mrs. Franco-Turner by 15 May 2005. Applications received after 15 May 2005 will not be considered. The selection of the participants will be made by the Advisory Committee and participants will be informed of the outcome of their application end June/beginning July 2005.